It's been just over two weeks since I took a little break from blogging whilst I had family over from the UK and did a bit of travelling around California. I feel well rested and ready to get back into the swing of things, but whilst I was on my break I was trying out a few new hair care products for you guys. I was kindly sent 2 conditioners and a clay hair mask by the new Matrix Biolage R.A.W collection by the lovely ladies at Look Fantastic. I actually used to order quite a bit from Look Fantastic back when I was living at home in the UK because they stock so many great brands from low end to premium and I found the price to be purse friendly with lots of offers on! I didn't realise they had a US site so now I am back on the Look Fantastic hype, happy days! 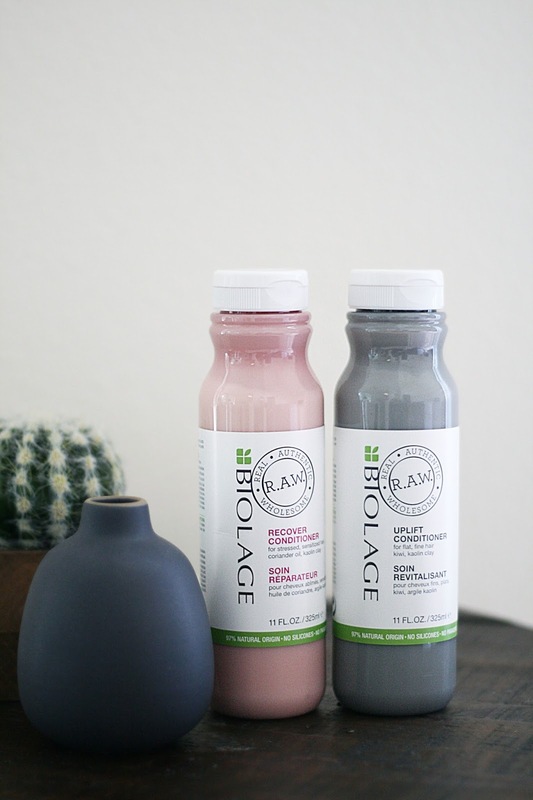 Before I go into what I thought about the products I was sent I thought I would give you an overall description of the Matrix Biolage R.A.W range. R.A.W meaning Real, Authentic, Wholesome. The whole collection is formulated without sulphates, silicones, parabens or artificial colours. Instead the products contain ingredients that are 95% natural origin, 99% biodegradable and the bottle it comes in is 100% recycled plastic. I have definitely seen an increase in more natural products on the market from recognisable companies and its really lovely to see them being more conscious about the consumers health and the environment. 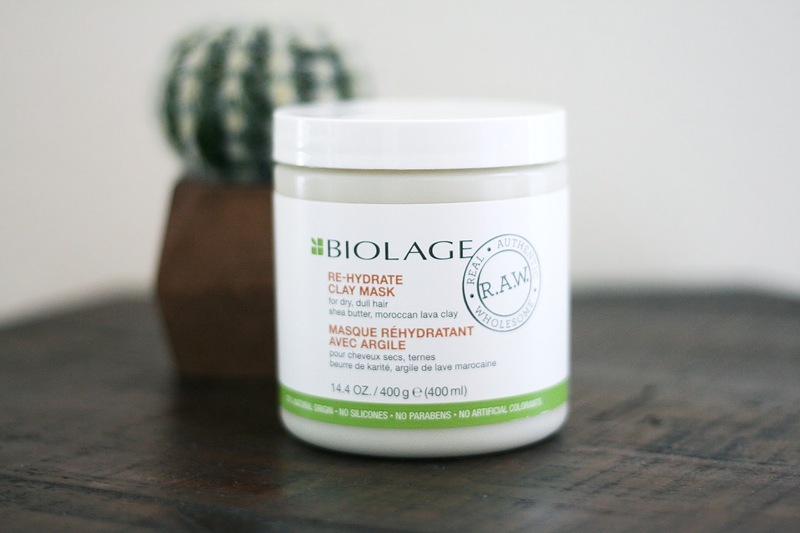 Matrix Biolage R.A.W Recover Conditioner | That millennial pink gets me every time so obviously this was the first conditioner I tried out of the bunch. I love the packaging for the shampoos and conditioners as they have a smoothie bottle kinda vide, don't you think? Which completely goes with the more natural theme oh so nicely. This product is ideal for people with sensitive hair. The main ingredients in this one is coriander oil and kaolin clay which got me slightly worried at first, was my hair going to smell like coriander? Well no, far from it actually, if you look closely in the ingredients list there is some perfume in there which I personally don't mind especially as it has a sophisticated Aesop kinda vibe to it. They all have this delicate chic scent to them FYI. The consistency is thick and smooth but spreads well over shampooed hair, I tend to use more than I need to really but my hair is thick and I want to achieve super soft hair always! Matrix recommends leaving on for 1-2 minutes I leave it on for around 5 and comb through my hair in the shower just to optimise the conditioner coverage. The product washes out well without leaving any residue, and feels and looks nourished and glossy once I've styled my hair. It definitely has a salon quality but without the salon price, at the moment you can buy this conditioner for $16 on Look Fantastic (usually $20) Would I buy this myself? Yes, It's such a good price and I love the soft results. Matrix Biolage R.A.W Uplift Conditioner | Again I love the smoothie feel to the packaging and the grey is chic and looks particularly good next to the millennial pink 💕 told you I was obsessed. This conditioner is ideal for people that want more volume i.e. me! The consistency is thick and smooth but this product has a light grey colour to it too which must be from the charcoal powder as there are no artificial colorants in their range. Again it spreads well and once washed off no residue either. Once my hair has been styled my locks are much more bouncier than usual but this didn't last for the first day, my hair actually looked fuller for two days after which was pretty impressive. I still had a little frizz but nothing my straighteners can't cope with. Again you can buy this for $16 on Look Fantastic at the moment, such a great price for a high end results. 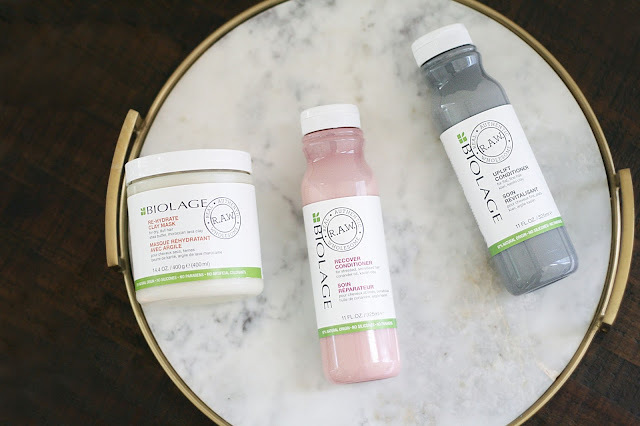 Matrix Biolage R.A.W Re-Hydrate Mask | I love having a pamper day a few times a month, where I put on a face mask, hair mask and give myself a pedicure. Looking after your skin and hair is imperative, and I sometimes feel that people forget to look after their hair in the same way they look after their skin. Once or twice a month putting a hair mask on can revive the look of dull and damaged hair, and you only have to leave masks on for minimum of 5 minutes, its hardly hard work! This hair mask in particular is ideal if you like me have dry damages hair, I dye my hair every 6 weeks and use heat on it daily, so after a while i'm left with lifeless brittle hair. I love that this mask has shea butter in the ingredients as it is extremely moisturising, also Moroccan lava clay which is enriched with minerals and excellent for de-hydrated hair. This is a super thick mask and has a clay feel to it, but it does absorbs nicely into the hair and spreads evenly. It did leave my hair feeling much more stronger than before and simply healthy and manageable. (my hair didn't knot up as easily because it wasn't as dry) The tub is absolutely huge too, for $19.50 you get 400g of product, and because you won't need to use this everyday it will last a long time, money well spent! If you are looking for a healthy hair care alternative but with salon quality I would highly recommend giving this a try especially if you like a more sophisticated scent too. For me personally I would repurchase the up-lift conditioner and the re-hydrate mask just because they work best for my dry coloured hair. I am pretty intrigued to try more from the range like the shampoos, its always interesting to see if these products when formulated without all the nasties if they still foam up in the same way and absorbs effectively into the hair. If you have tried them then please let me know your thoughts!